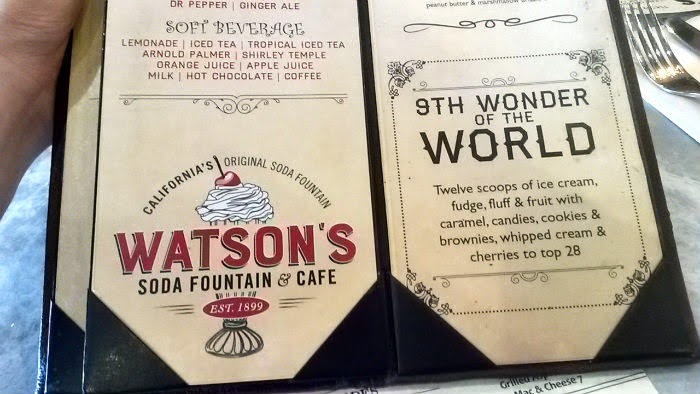 Watson's Soda Fountain & Cafe is located on E Chapman Avenue in Orange, California. My friend took me to Old Town portion of Orange, California for this one. 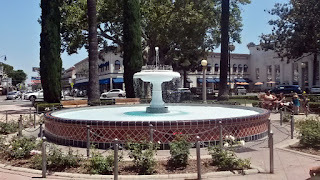 I even got to see the Old Town Circle, a roundabout where many cars pass through each day. 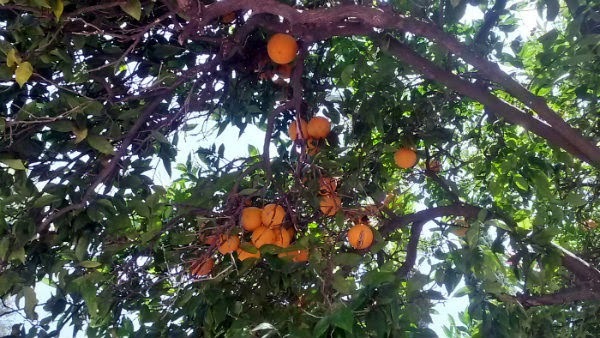 In the middle is a fountain, an orange tree, some benches, and more. 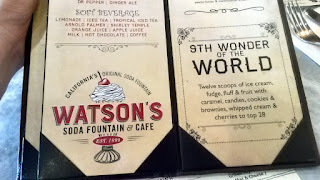 Watson's is a historical landmark, having opened in 1899 and was your typical drug store and soda fountain shop. While the drug store portion appears gone, it has retained its old school feel and memories of years past adorn the walls. It is dubbed "California's Original Soda Fountain." You can read all about Watson's history here. Breakfast options range from breakfast burritos to the more traditional meat/eggs combo. 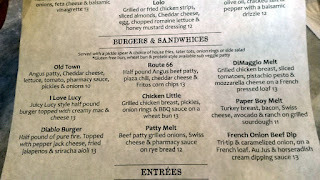 Lunch and dinner choices range from burgers/fries to a Buffalo Chicken Mac & Cheese. Portions are very generous here. 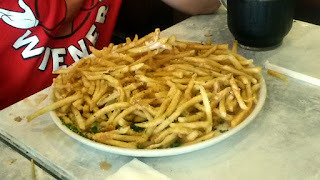 For a few years, they have held a food challenge dubbed the "Eighth Wonder of the World" ($32). 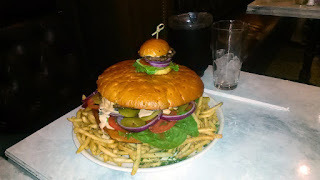 It's a large burger, probably 4-5 pounds total, served over a pound of fries. Time limit is one hour. Winners get a T-shirt. 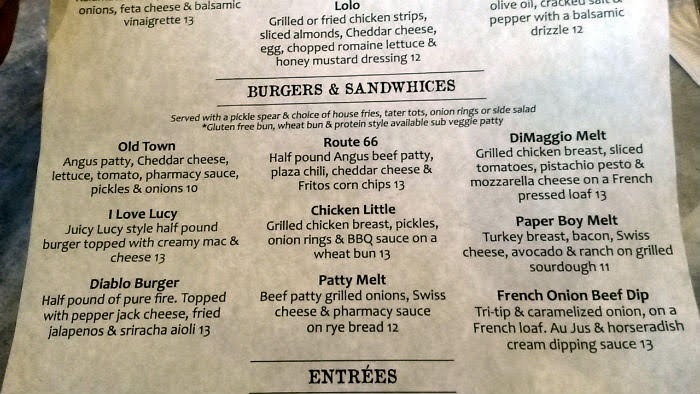 While this challenge does not appear anywhere on the menu now, it still existed as of late June 2018. So naturally, my nutso friend decided to take the challenge. It's served on a pizza pan, and there's even a slider on top that also must be eaten. We both thought that there had to be at least two pounds of fries on that pan. But it looked like delicious garlic parmesan fries, at least. For food challenge aficionados, it is a smaller version of the OMG Burger at The Catch in Anaheim, which can be upwards of 12-15 pounds. Not surprisingly, my friend was a celebrity the entire time. Several people watched and a few more took photos of the challenge burger. I'll let you head over to my friend's YouTube channel to see if he conquered the Eighth Wonder of the World challenge. There's also a "Ninth Wonder of the World" challenge that is now on their menu. 12 scoops of ice cream, fudge, fluff, and fruit. Then add caramel, candies, cookies, brownies, whipped cream, and cherries. It's $28 and would easily feed a family. I don't know if this is an actual challenge, but it obviously fits that description.